The following workshop was held. "Post-City Core Rivers: What Do We Need Now?" ： "The City Core Rivers as Bustling Places and Tourist Resources"
： "Future Rivers in Tokyo to be Created with Citizens"
： "Landscape Development from the Viewpoint of River and River Banks"
The workshops were held based on the themes of Part 1. 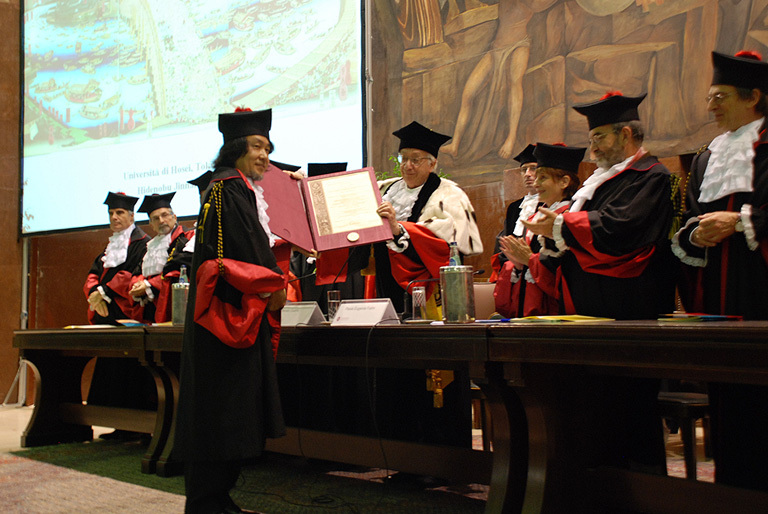 On 22 October, Hidenobu Jinnai (the director of Laboratory of Regional Design with Ecology) awarded Emeritus Bachelor's Degree from Roma University. His historical studies on urban structures and spaces were evaluated as having contributed to urban and regional research fields along with his experimental as well as cutting-edge methodology. After the award ceremony in the main hall of Roma University, he gave a lecture, "TokyoﾑUrban Regeneration based on History and Ecology". In the field of architecture, he was the second person who awarded the Emeritus Bachelorﾕs Degree (the first person was architect Tadao Ando). Nov.02,2007 The following report was issued. "Researches on Transformation of Countermeasures against High Tides in Tokyo"
The following research meeting was held. "Regeneration of Waterfront Environment and Architectural Design in Hino City"
--Residential Environments Utilizing Canals from the Viewpoint of Landscape Analysis in Hino City"
"Situations of Spring Water Conservation and Improvement"
"Environments and Cultures of Italian Cities"
We invited a photographer and an architect who have worked focusing on Italian cities, and hold a research meeting titled "Environments and Cultures of Italian Cities—Roma and Venice". The two Japanese specialists introduced us cutting-edge trends in recent Italy. The dynamic discussions were developed from the various viewpoints based on each field and various cities. ： "Beautiful Laguna in Venice Seen From a Finder"
He was born in Fukagawa, Tokyo. He has worked focusing on water environments. He has made it his life to take photos of Venice and recently issued a photo collection, "Venice—Beautiful Laguna (『ヴェネツィア　麗しのラグーナ』)". He will have a photo exhibition in Tokyo Midtown. He gave a lecture on water environments in Venice based on his works. ： "Restoration of Historical Architecture in Italy and Japan—Case Studies and Operational Methodology"
： Hidemichi Takasaka, Nihon Sekkei Inc. He completed faculty of engineering at the University of Tokyo. He studied as a student of doctor course at the department of architecture, Roma University. He got PhD in study on "recupero"(restoration and renovation). He works for Nihon Sekkei Inc. He gave a lecture on his research results on recupero in Italy. Dec.04,2007 The following report was issued. "Local Design for Renovation of Waterfront Cities Vol.4"
： "Research Results from Historical and Environmental Viewpoints in Hino City and Proposals for Houses Rooted in the Region"
In "The Second Kokubunji Cliff Line Conservation and Regeneration Forum" was held in 10 November where citizens and universities showed many panels. Because we could not have time to discuss on panels, this time we hold sessions along with panel exhibition. "New Wave for Designs of Rivers and Oceans"
The movement in Ohata-cho (present Mutsu City) of Aomori Prefecture gathered attention, because it triggered the revisions of River Law and Seacoast Law. The movement was evaluated as the turning point for public engineering works. The work was awarded the Grand Prix of Design Award 2006 by Japan Society of Civil Engineering, and Gold Prize of Good Design Award 2007 by Ministry of Economy, Trade and Industry. We invited Mr. Takao Tsunomoto, the key person of both planning and practice. His lecture covered conflicts against national government and local government, collaboration with citizens and academism, etc., which gave us many hints for future regional designs. Dec.16,2007 Hidenobu Jinnai, Director of Laboratory of Regional Design with Ecology, gave a keynote lecture at the event held in Hosei University. "The Community Development in the 21st Century-Kagoshima and Napoli, The Value Transformation from South"
"Living Spaces and Environment of Water Settlements"
—Spatial Compositions and Living Environments of Houses in Sandakan and Kota Kinabalu"
Theme: "Philosophical Trends for Urban Regeneration DesignsﾑIssues and Perspectives"
Mr. Gen Kato is a famous practical designer in the urban design field and other areas, and also a strategic producer in the overall processes from planning/design to business development. For the research meeting, he precisely reviewed urban renovation projects promoted in city cores of Tokyo area and local urban areas. Based on oversea case studies, he reported their situations, issues and perspectives, especially on measures to overcome systematic bottlenecks. He will give lectures on "study on urban design" at Hosei University (Faculty of Engineering), and on "urban design" and "public space design" at Faculty of Engineering and Design, Hosei University. Mr. Mimaki completed the Graduate School of the University of Tokyo and joined Institute for General Urban Studies, which is one of the leading think tanks in Japan. He is one of the young urban space analyzers, actively works in practical researches. In this research meeting, he reported research results on "landscape planning for Tamagawa" focusing on measures related to landscape formation, which was the funded research by Foundation of Riverfront Improvement and Restoration in 2005. The following symposium was held. Purpose ： Various NPOs focusing on "water (=neighborhood river and ocean)" are collaborated and involved in regional development by utilizing nature and living cultures in the west region of Kochi Prefecture (Shimanto/Hata). These NPOs share viewpoints such as "rediscovery of local resources such as nature and culture", "introduction of new values and way of thinking", etc. However, they also share issues such as regional commons, administrative systems, reliability and understandings from citizens, etc. This symposium, based on the one held in the last year (at the skyhall of Boissonade Tower of Ichigaya Campus, Hosei University), was held in Kochi to summarize achievements at the time and to exchange opinions with citizens. We also aimed to clarify the roles of NPOs in regional management of rural areas (which refer to areas including agricultural areas, mountain areas, fishing villages and small cities where influences of mega city are relatively small). Theme ： "How to Create Rural Tourism for Mutual Leaning"
Theme: "Regional Management Based on Network and Collaboration"
Theme ： "Regional Management Based on Network and Collaboration"
Place ： Main Hall, 2F, Kuroshio-cho "Hoken Fukushi Center"
13:25 Keynote Speech "Regional Management Based on Network and Collaboration"
13:40 Invitation Lecture "Approach of Tanabe City Kumano Tourism Bureau"
Mitsutoshi Sugimura (Standing Director, Group for Considering Tombo (Dragonfly) and Nature (社団法人トンボと自然を考える会)"
Feb.09,2008 The following report was issued. "Utilization and Control of Channels and Waterfronts in England"
Feb.19,2008 The following report was issued. -Shimanto Hata Areas, Kochi Prefecture- (Symposium Report of 27 Nov. 2006)"
The Debrief Session of Activities of Laboratory of Regional Design with Ecology (2007) was held. Sky Hall, 26F, Boissonade Tower, Ichigaya Campus, Hosei Univ. "Exhibitions Held by Faculty of Engineering and Design + Laboratory of Regional Design with Ecology-For Final Research Results-"
"Proposals for Environmental Values and Project Evaluation of Irrigation Channels"
"Consciousness and Actions toward Irrigation Channels in Citizens of Hino"
Mar.09,2008 The following report was issued. -Case Studies of Hino City, Hanyuryo, and Sendai City-"
The following exhibition was held by Laboratory of Regional Design with Ecology. Exhibition, "Water Tokyo Seen from Outer MoatﾑFor Historical and Ecological Corridor"
The outer moat was the outer framework of the Edo Castle and the core of the water system in Edo. It had served the key role in the water system of Tokyo area since ancient times. Before the Jyomon Era, "Old Tokyo River" (present Tamagawa, Arakawa, and Tonegawa) had flowed toward Tokyo Bay located below the Edo Castle constructed in the later day. Since the Edo Era, dense canal networks in the vast lowland formed by Arakawa and Tonegawa were connected together below the castle. Tamagawa Canal and its diversion channels constructed in the Musashino Tableland formed by Tamagawa, were also linked to the outer moat of the castle. The groundwater under the above water system spread over the vast river basin of Old Tokyo River. People depended upon and controlled the water system. The system spread in a radial pattern or circular pattern, composing a wide "water network city" around the castle. The inner and outer moats were the core of water ring linking with head waters in outer edge of mountains. Even today, the outer moat configures the water corridor which encircles city core of Tokyo. Similar to other waterfront areas in Tokyo, the issues such as degradation of water quality, and how to use should be considered. For looking over the future way of Tokyo area, we should be based on historical and ecological backgrounds. Our activities aim to regenerate regions based on the viewpoint of eco-history. Starting from the outer moat along which Hosei University is located, we will hold the exhibition proposing regeneration of whole water system of Tokyo area. Furthermore, we will propose historical/ecological corridor in Tokyo area. *"Ubiquitous exhibitions" will be held in various sites. Outer Moat: We will show rich landscapes and latest situations of inner and outer moats as cradle of culture which encircle the Edo Castle. For regeneration of moats, we will consider water system regeneration through the old system where Tamagawa canal was included. The regeneration of outer moat is one of our major issues because Hosei University is located along the moat. One of our involvements for regional regenerations, is "Chiyoda-gaku" which has been realized by cooperation between Chiyoda-ku and Laboratory of Regional Design with Ecology. Tokyo Area: Regarding low lands and city core, we will address regeneration of canals, Nihonbashi, and bay area, etc. As for table lands, we will introduce local activities developed in Hino, Koganei, and Suginami, spring water conservation activities for Nogawa, and regeneration of Tamagawa canal, etc. Also, the relationship between Laboratory of Regional Design with Ecology and communities will be shown; e.g., head water areas of Tamagawa, Arakawa, and Tonegawa.